(Nanowerk News) The Estonian Materials Technologies Competence Centre (MATECC) has just signed an agreement with the European Space Agency. Researchers of the centre and of the University of Tartu will start to develop a nanotechnology lubricant suitable for extreme conditions. Shuttles and equipment used in space consist of numerous elements and have several friction-prone details, the surface of which must be greased to ensure smooth operation. Due to extreme temperature, pressure and radiation conditions, conventional oils and greases cannot be used in space. This is why solid substances such as molybdenum disulfide and graphite are preferred for space usage. These materials are continuously developed to achieve a sufficiently long action time and reliability required for space applications. PhD student Triinu Taaber working in the laboratory of physics of nanostructures. Now that Estonia is about to become a full member of the European Space Agency, Estonian enterprises also get the chance to contribute to space-related development. 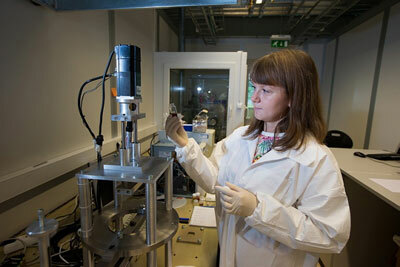 Researchers involved in the activities of the Estonian Materials Technologies Competence Centre have been studying friction mechanisms and the characteristics of materials on the nanoscale for several years already and developed novel additives to lubricant oils together with the industry. The acquired knowledge and experience will be also used in the new cooperation project with the European Space Agency. Martin Järvekülg, Research Fellow in Materials Science at the University of Tartu and Project Manager of the Estonian Materials Technologies Competence Centre said that the aim of the cooperation between the centre and the European Space Agency is to develop a lubricant based on the combination of nanoparticles and ionic liquids. In normal environment, ionic liquids are liquid salts with extremely low volatility. “The novel lubricant must be effective under both normal pressure and under vacuum, both in high and low temperatures,” said Järvekülg. If the researchers succeed in combining the strengths of liquid and solid lubricants in the new compound material, the results of the project can be also used elsewhere, where the extreme environment or the specifics of application place higher demands on the materials. The first stage of the project lasts for one year and will, among others, also involve the researchers and degree students of the Institute of Chemistry and the Institute of Physics of the University of Tartu. One of the main implementers of the project is Triinu Taaber, Specialist of the Estonian Materials Technologies Competence Centre and doctoral student of the UT. According to the Vice Rector for Development of the University of Tartu Erik Puura, the signed international agreement proves that the competence and facilities of the researchers of Tartu are world-class in the field of nanotechnology.